The eight-day movement has going and striking trains, driven by a single barrel. The going train has verge escapement, with short, silk suspended pendulum between cycloidal cheeks. 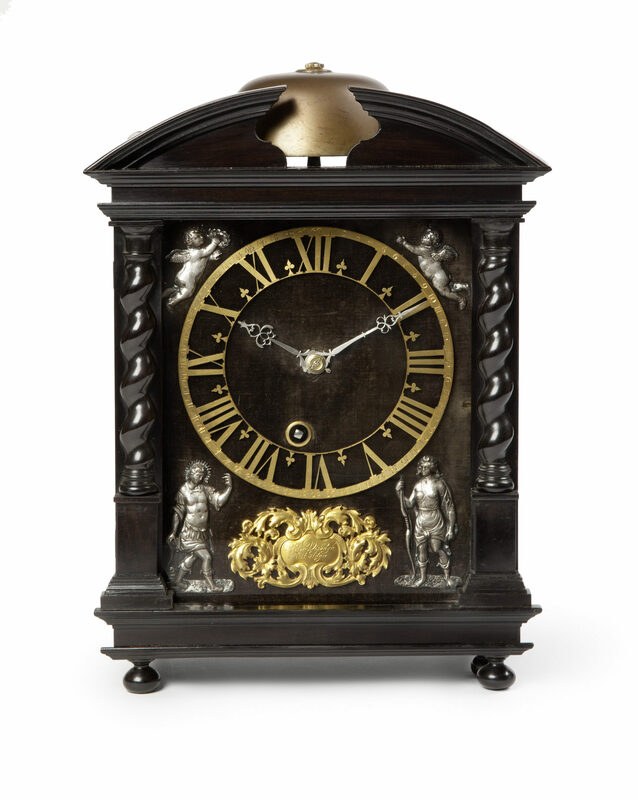 The hour striking indicates the hours on a bell mounted on the top of the case, behind an arched, moulded pediment. It is regulated by a count wheel with Arabic numerals indicating the position of the striking train. 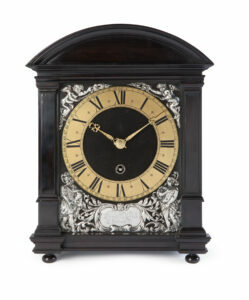 The black-velvet covered dial can be turned outwards on hinges to the left. 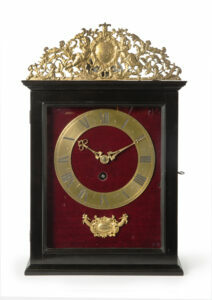 It has a gilded skeletonised brass chapter ring with Roman hour numerals, half-hour and Arabic minute divisions. The time is indicated by a pair of pierced silvered hands. Under the dial is an elaborate repoussé leaf cartouche which is signed by the maker: Pieter Visbagh Fecit Hagae. Behind this cartouche, which is hinged, is a hole through which the pendulum can be set going. The top corners have repoussé silver spandrels in the shape of cherubs, whilst the signature cartouche is flanked by two repoussé silver figures. 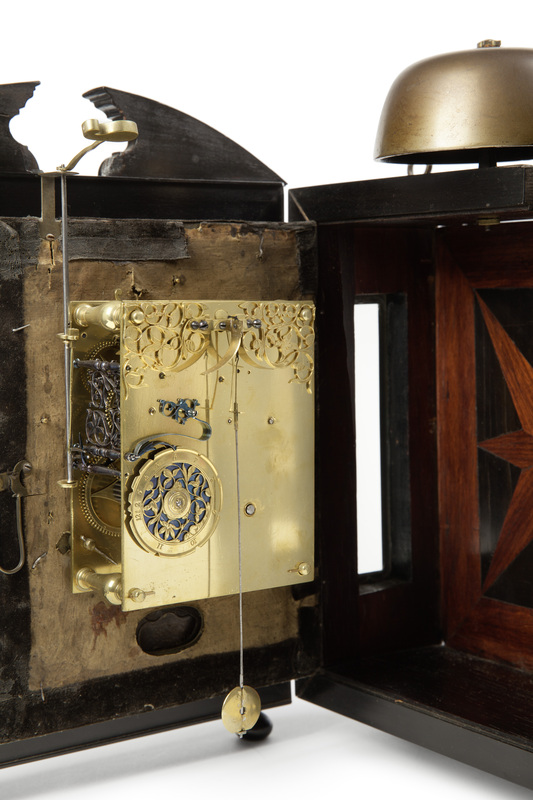 The broken-arch case is made of ebony-veneered pine. The glazed front door is flanked by barley twist pillars, whilst the sides have glazed rectangular panels with moulded frames. Upon turning the dial, a star-inlay in the back board is revealed. 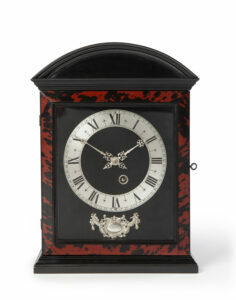 At the rear side of the top of the case there are two suspensions eyes, making the clock both a table and a wall clock. 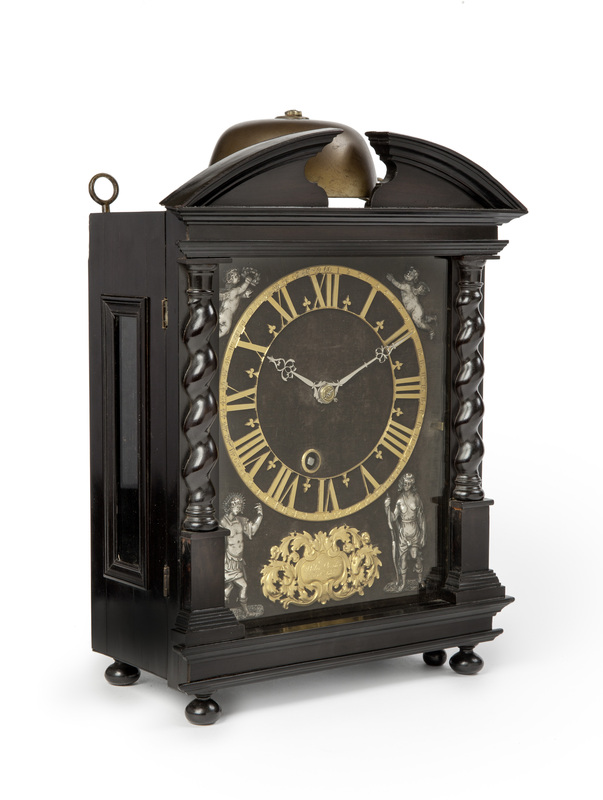 The whole rests on five ball feet, the fifth to prevent the clock from tipping over when the door is opened. – W.F.J. Hana, Klokkenkijkboek, Houten, 1971, plate 21. 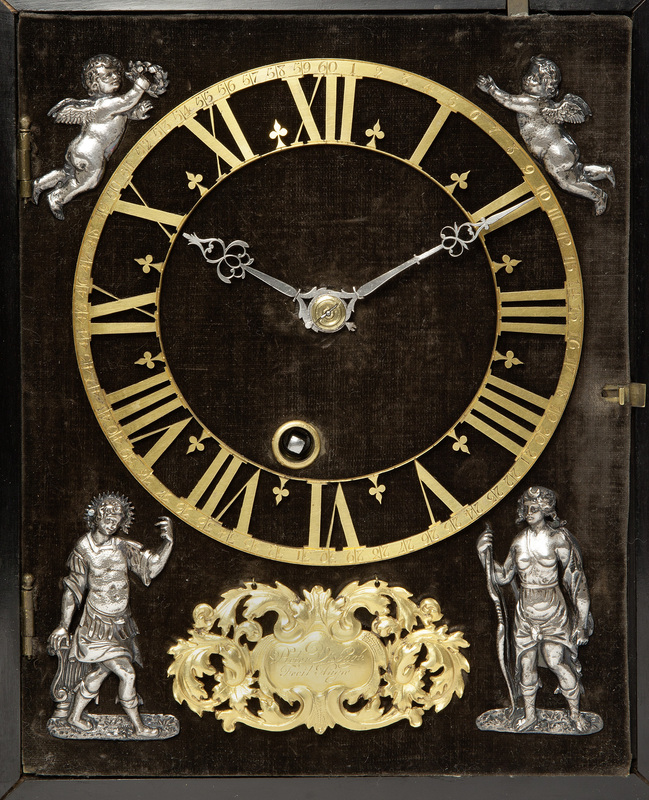 – E. Morpugo, Nederlandse Klokken- en Horlogemakers vanaf 1300, Amsterdam, 1970, p. 133. – Dr. R. Plomp, Spring-driven Dutch Pendulum Clocks, 1657-1710, Schiedam, p. 236. 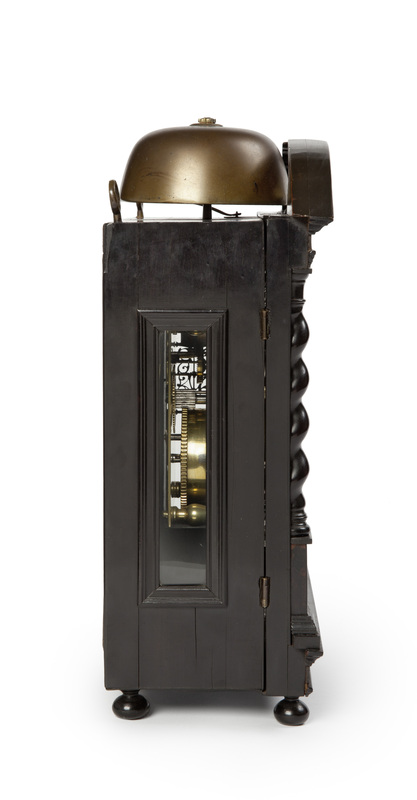 – H.M. Vehmeyer, Clocks – Their Origin and Development 1320 – 1880, Gent, 2004, pp. 312-313. Pieter Visbach/Visbagh. Born circa 1634 in The Hague; died there in 1722. Apprenticed to Salomon Coster in 1646; moved to Middelburg in 1652, where he probably worked with Adam Oosterwijck, Severijn’s father. After Coster’s death in 1659 he returned to The Hague and in 1660 took over the workshop from Coster’s widow, accepting the obligation to keep on young Christiaan Reijnaert as an employee. One of the witnesses to this contract of sale was Jacobus van Leeuwarden, Jan Jacobszoon’s father. He first rented a house in Wagenstraat/Veerkade and later, in 1671, bought it. From 1660 to 1685/1690 he was the most important clockmaker in The Hague. 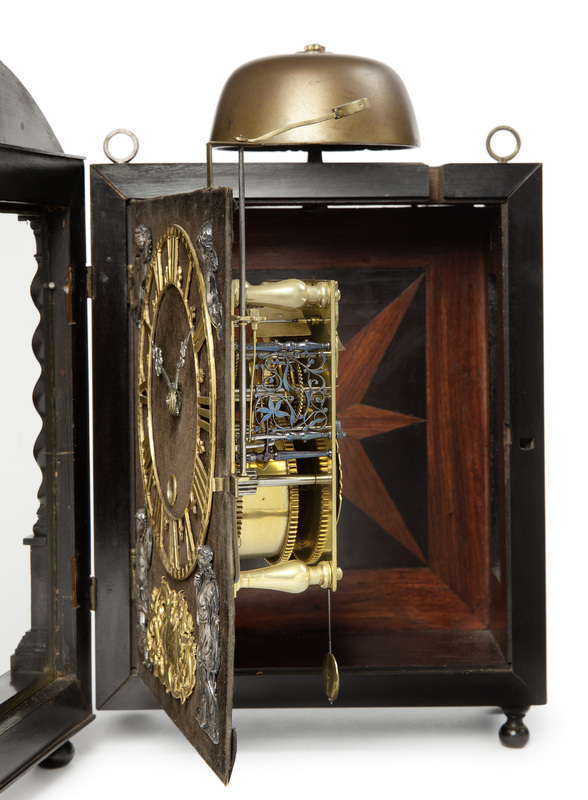 A great many of his clocks have been preserved. 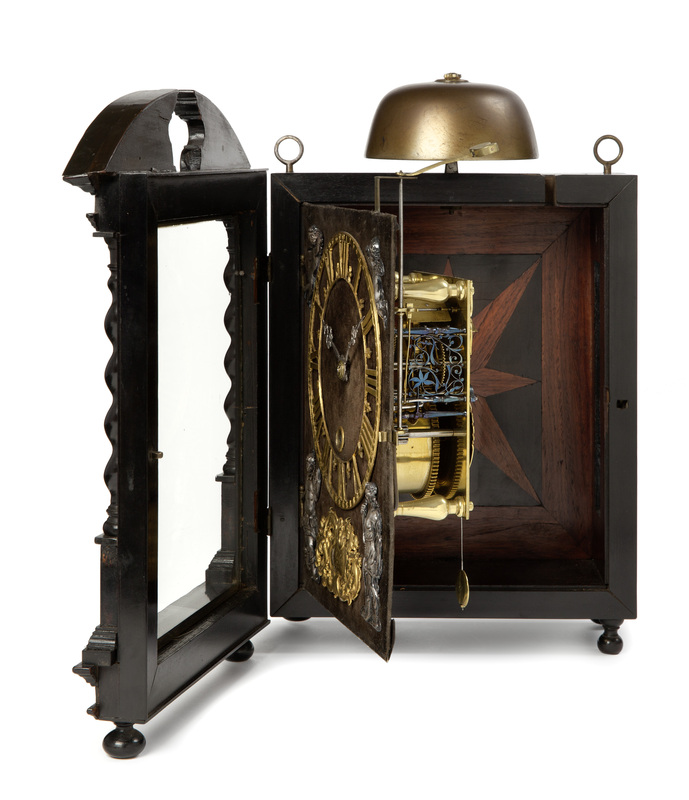 He was the first master of the Clockmakers’ Guild in The Hague, founded in 1688. His younger brother Geerlof was also a maker of Hague clocks; his son Frederick succeeded his father as keeper of the clock of the Nieuwe Kerk (New Church).